Model 6010 Side outlet. Full nozzle design with bronze/brass trim. Available with O-ring seats. For exceptional leak-free performance. Model 6021 Same as model 6010 with Teflon® (PFA) disc insert. For exceptional leak-free performance (use on steam only). Model 6030 Same as model 6010 except Stainless Steel (SS) trim (nozzle and disc). Available with O-ring seats for exceptional leak-free performance. Model 6182 Top outlet. Full nozzle design with bronze/brass trim. O-ring seat available for exceptional leak-free performance. Model 6121 Same as model 6182 with Teflon® (PFA) disc insert. For exceptional non-leak performance (use on steam only). Model 6130 Same as model 6182 except SS trim (nozzle and disc). O-ring seat available for exceptional leak-free performance. Model 6186 Top outlet. Full nozzle design with bronze/brass trim. 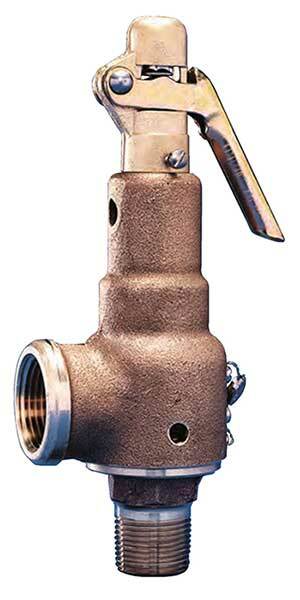 150 psig [10.3 barg] maximum set pressure. Replaces Model 86 (original equipment only). Model 6283 Over-sized side outlet. Full nozzle design bronze/brass trim. Model 6221 Same as model 6283 with Teflon® (PFA) disc insert. For exceptional leak-free performance (use on steam only). Model 6230 Same as model 6283 except SS trim (nozzle and disc). Model 6933 Same as model 6010 except certified for ASME code Section IV. Low pressure steam heating boilers set at 15 psig [1.0 barg] only. Model 6934 Same as model 6021 except certified for ASME code Section IV. Low pressure steam heating boilers set at 15 psig [1.0 barg] only. Model 6935 Same as model 6030 except certified for ASME code Section IV. Low pressure steam heating boilers set at 15 psig [1.0 barg] only. O-ring seats available for exceptional leak-free performance, reduced maintenance cost, multiple cycles with tight shutoff, improved seating integrity. Wide hex on valve nozzle provides wrenching service clearance for easy installation. Dual control rings offer easy adjustability for precise opening with minimum preopen or simmer and exact blowdown control. Grooved piston model disc reduces sliding area and friction.